We proudly present ourselves as a noted wholesale supplier and exporter of Red 48.3 Plastic Pigment from Ahmedabad, Gujarat. We supply Red 48.3 Plastic Pigment processed by manufacturers who well-test the Pigment to ensure a pure range to the customers. The Plastic Pigment we supply is 100% pure, non-hazardous and has an excellent shelf life. 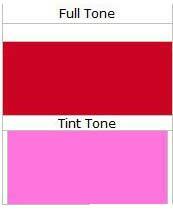 We offer this Red 48.3 Plastic Pigment with eye-catchy and strong packaging. GENERAL DESCRIPTION : PIGMENT RED 48.3 IS STRONCIUM LAKE BRIGHTER RED PIGMENT, HIGH COLOUR STRENGT AND GOOD FLOW, DISPERSIBILITY AND MODERATE FASTNESS PROPERTY USED IN INK, PLASTIC ETC.